The 7000 Series of Mag Rak magazine racks are a group of products which set themselves apart with their unique and distinctive styling. Created by award-winning Dutch designer Toon Van Tuyl, this classic display is a stately, impressive piece of furniture. 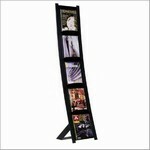 With black textured metal and five adjustable shelves, you can showcase a variety of magazines and literature. An optional magnetic retaining bracket is available to hold large/multiple pieces in place. A functional and elegant addition to any office.